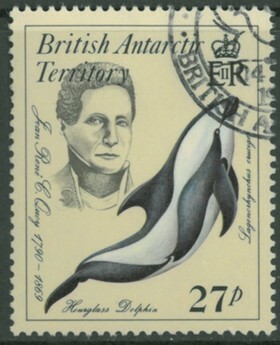 In 1820, a sketch of this dolphin was made. It was identified as a new species, sight unseen, in 1824. Since then, only seven of these dolphins, net-caught or washed onto the beach, have been examined. None have been captured alive. What is this secretive creature? This is the Hourglass dolphin! It gets its name from the white sideways hourglass marking along its side. It lives in cold waters and shares the feeding areas of true whales, eating squid and small fish. * It's beautiful, and not much is known about it, but here's how it identify it for the test we'll have! You may never see one alive, but you can watch two Hourglass dolphins in the video below! * Read about one stranded in New Zealand last year here.